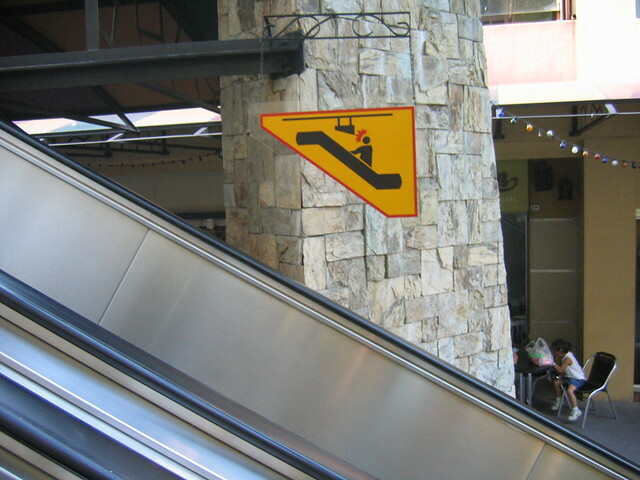 Recursive Escalator Sign | Flickr - Photo Sharing! The sign is comical in itself: stick figure hits his head on overhanging sign. Beware! But this is a SIGN ABOUT THE SIGN. The logic behind its existence escapes me: without the sign there, there would be no need to warn about it. orijinal, みずか, jeremydouglass, and 217 other people added this photo to their favorites. Actually that sign is necessary. A lot of escalators have these signs or plastic "blockers/shields" to prevent anyone (mostly kids) from dangling their head, looking over the escalator. If you notice that further up there's this steel beam that would act like a pair of scissors to a child's head as the escalator went up. The sign prevents people from getting guillotined by the steel beam. if you go to older department stores you'll see that they most likely had retrofitted their escalators with some type of plastic "shield" similar to the sign. I'm not an escalator expert. It just happened to a childhood friend of mine and he has a big scar on his neck due to being caught going up the escalator. 'hope that clears up any confusion. Are you guys serious? Get lives. It's funny, who cares about the angle and whatever else. I got a laugh out of this. Thanks, Lush, for posting it. That does make more sense now, thank you rio. Still say it looks awfully photoshoped... there's no reflection or shadow on the sign which makes it look drawn in, or at least touched up. Sweet catch :) It makes my head hurt just thinking about it. got this link from digg. i used to hang out in the building where that picture was taken from. it's hanging on the side of the escalator. so if you're one of those guys who love to stick out half of their bodies out of the elevator while gawking at the ladies on the lower floor level and you're not paying attention of what's ahead of you, you would hit the sign first (like a warning) before you get your head angled between the handrails and the next floor level that you're going to. thx for the picture lush, it really made us laugh here. kumusta mula sa mga kababayan mo from canada! I can't really explain why, but this strikes me as a perfect metaphor for the universe itself. it's like the sign that says "Don't read this sign"
Recursive isn't quire the right word for this. Also, this seems silly, but I've seen a few of them and they are needed. Some put them there just to not hit the nearly invisible acrylic shield put into place, and some have a sign on the other side and the back side just reminds people not to smack into the sign. But recursive got me to clicking the Digg link. Congrats sa picture mo, kabayan. your words, are why a sign is required! gold!!! I agree with threevolve. Great to have a laugh! It is funny, thanks for sharing! so well observed :-) I don't think I would ever have thought about the recursive nature of this sign! Hi, I'm an admin for a group called Doh! Silly signs!, and we'd love to have this added to the group! It would be great if you could also join us at the group. Looks like a fractal sign!